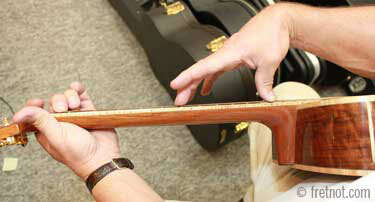 Truss rod adjustments are made to alter the straightness (flatness) of the neck. Truss rods often require adjusting after changing string gauges or when temperature and humidity change the amount of bow in the neck. Read how to check neck relief, find the truss rod nut, determine the correct measurement and avoid common problems. Relief is calculated with the instrument tuned to pitch so we can measure the bow created by string tension. With a straightedge placed between the D and G strings, bow will become apparent. The largest gap is usually towards the center of the neck. The distance between the top of lets say the 7th fret and the bottom of our straightedge can be measured with a feeler gauge to give us an exact measurement. Fret the string on the 1st and last fret of the neck. More commonly we use the string itself as a straightedge. Fret the string at the 1st and last fret. Measure the gap between the bottom of the string and the top of the 7th fret. A capo can be used on the first fret to free up one hand. A large gap will indicate the neck has too much relief and the rod may require tightening to straighten the neck. No gap may indicate the neck is dead flat of backbowed which may require loosening the truss rod to add relief. What does it mean if there is no gap? 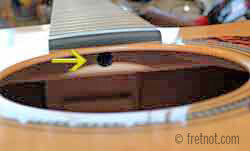 If no gap is seen between the bottom of the string and the top of the fret then either the neck is dead flat or it is back bowed. Ideally we are adjusting the truss rod to render the neck as flat as possible without creating too much string buzz. It is important to understand that there is no single measurement that will be correct for all acoustic guitars. String gauge, playing style, neck and top stiffness can vary from one guitar to the next and as a result, so can ideal neck relief. .004"- .006" is probably best for light pickers, jazz musicians and instruments strung with medium gauge strings. .008"- .012" is probably best for hard strummers, guitar's strung with extra light gauge strings and fingerboards with a tighter fingerboard radius. The measurements above serve as simple guidelines and starting points to those still learning about neck relief. How else would we understand what "just a little" or "way too much" actually equals? When making truss rod adjustments I first assess the instrument's action and playability along with the players aggressiveness and playing style. That is why truss rod adjustments are normally done in conjunction with a set up. Starting with a dead flat neck I increase neck relief slightly until the instrument plays without buzzing. That being said ...you must have an understanding of what other issues can cause an instrument to buzz when using this as your gauge. Truss rod nuts are located at either the peghead or the end of the neck. Nuts located at the peghead are often concealed behind a small truss rod cover and are easily accessible. 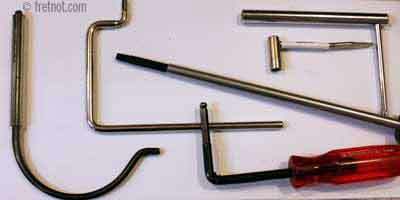 These will require either an allen head wrench or a socket style truss rod wrench. Truss rod nuts located at the heel end of the neck are often accessible thru a hole just beneath fingerboard extension and thru the top brace. thru a hole in the top brace. In general these will require an allen head wrench which will pass thru the hole and straight into the nut. The depth at which this nut is located can vary which means some instruments will require a longer wrench than others. Using an L shaped allen wrench on these truss rod nuts provides greater leverage. A few instruments have truss rod nuts at the heel that are not readily visible. A mirror must be placed inside to see the access point. These often require specially shaped wrenches which will snake around the top brace and back up to the heel of the neck. Notice the curved wrench to the left below ...this passes under the top brace and back up to the truss rod nut. If a neck has too much relief (upward bow) tightening the truss rod will straighten the neck. How? The truss rod is actually compressing the neck exerting pressure against the backside of the neck which causes it to bend backwards. If a neck is too flat or backbowing, loosening the truss will add relief. How? Relief is actually created by string tension, once a truss rod has been completely loosened the strings not pull relief into the neck with less resistance. Changing string gauges may require a truss rod adjustment as this changes the tension on the neck..
Finding a balance between the tension exerted by the strings and by the truss rod is how we control the amount of relief. This is why the instrument should be tuned to pitch before adjusting the truss rod in most cases. How Far Do I Turn The Truss Rod Nut? Start by making small adjustments, say 1/8th of a turn. On some instruments this may result in a noticeable change in relief, in others it may not. The amount the rod must be turned will vary according to the type/quality of truss rod and amount of adjustment necessary. Adjusting the truss rod with the instrument tuned to pitch will allow us to gauge our progress and continue re-checking relief before making further adjustments. The number one reason people won't touch the truss rod is that they are afraid of making a mistake and damaging it. It's a healthy fear actually but once you understand how it functions and get some practice you should be able to make these adjustments yourself. Numerous instruments have come to me with striped truss rod nuts, this is avoidable in most situations. Using the wrong sized wrench/socket may permit it to round out the threads and ruin the nut. Not all truss rod nuts are replaceable, some are welded to the rod. Be sure to use the correct wrench! *If a truss rod is already as tight as it can go, starting an adjustment by tightening the nut first could end in a horrifying pop. If one starts by loosening the nut slightly they can quickly get a feel for how much tension is already on the rod. **Starch resistance and creaking sounds can be a sign that the truss rod should not be adjusted further and is more than enough reason to stop and seek help.